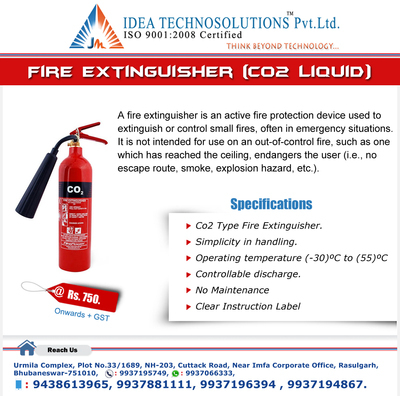 FIRE EXTINGUISHER (CO2 LIQUID):--> Specification:-- Co2 Type Fire Extinguisher. Simplicity in handling. Operating temperature (-30) degree celcious to (55) degree celcious Controllable discharge. No Maintenance Clear Instruction Label A fire extinguisher is an active fire protection device used to extinguish or control small fires, often in emergency situations. It is not intended for use on an out-of-control fire, such as one which has reached the ceiling, endangers the user (i.e., no escape route, smoke, explosion hazard, etc.). Urmila Complex, Plot No. 33/1689, NH-203, Cuttack Road, Near Imfa Corporate Office, Rasulgarh, Bhubaneswar-751010. Ph: -9937195749 Whatsapp - 9937066333 Mobile - 9937881111, 9937196394, 9937194867 Web URL - www.ideatechnosolutions.com.com . Email: info@ideatechnosolutions.com.